Experience the benefits of one-on-one instruction. As a Certified Personal Trainer I will develop a physical activity program to meet your individual needs and goals. The first session takes 1 - 1 1/2 hours, during which I assess your posture, range of motion, flexibility, and strength. A health history questionnaire and Par-Q (physical activity readiness questionnaire) are filled out and reviewed which will provide information so we can develop a program that will take you steps closer to your ideal lifestyle. Results-driven training session and progress tracking is maintained. As you progress with your program we will then up the ante and create a fresh (and challenging) new exercise program. I was privileged to start an exercise training program with Eileen Sheppard five years ago. I presented with very poor posture and I lacked strength in my body. Since working with Eileen I have mad tremendous progress in my strength and my posture has vastly improved. It’s a wonderful feeling to be strong and you can feel this improvement after every workout. An added bonus is increased bone mass, flexibility, balance and most important a wonderful confidence in yourself. Eileen has been a very caring exercise mentor and I believe it is because of her care and kindness that I have truly grown in my self-confidence – after all, when someone devotes their full attention to you for one hour, you feel very special - try getting that anywhere else. But don’t expect it to be easy – Eileen makes sure you work as hard as your ability allows for the whole workout to get results. 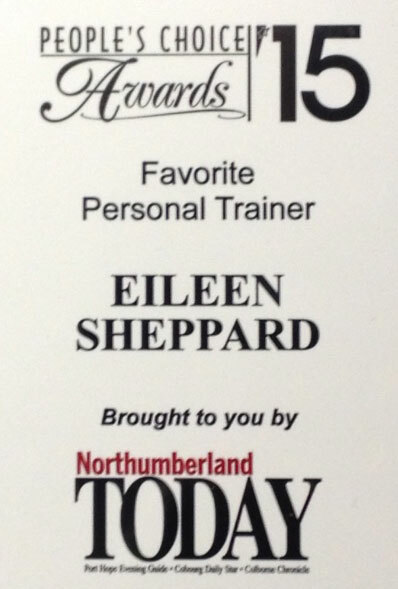 Eileen has been my personal trainer for more than 10 years. During a recent workout I was reflecting on the fact that when I first began, I didn’t know how to relax my body when instructed to do so during a particular stretch. I also consumed vast quantities of a diet soft drink, ate lots of processed foods, and thought that my body was strong as long as I could walk quickly and without pain. Working with Eileen has transformed my body and my life. She creates a personalized exercise program for each of her clients, certainly, but more importantly she educates, suggests, nudges, insists, demands and encourages each of her clients to achieve their full potential. It has been my choice to replace poor nutrition with good and occasional, halfhearted activity with focused daily exercise, but I wouldn’t have known how to make those choices and I absolutely would not have been able to sustain them without Eileen’s expertise and caring.